As we saw in Section 2.1, the three fundamental operations on signals have the property that if their inputs are sinusoidal (and if there is more than one input, if they share the same frequency), then the output is also a sinusoid at the same frequency. The only things that might change are the sinusoid's amplitude and/or initial phase. It's also true of many physical objects or systems that, if you apply a sinusoidal force at one point and measure the resulting motion at another, you'll also get a sinusoid of the same frequency, and that the output amplitude is proportional to the input amplitude. 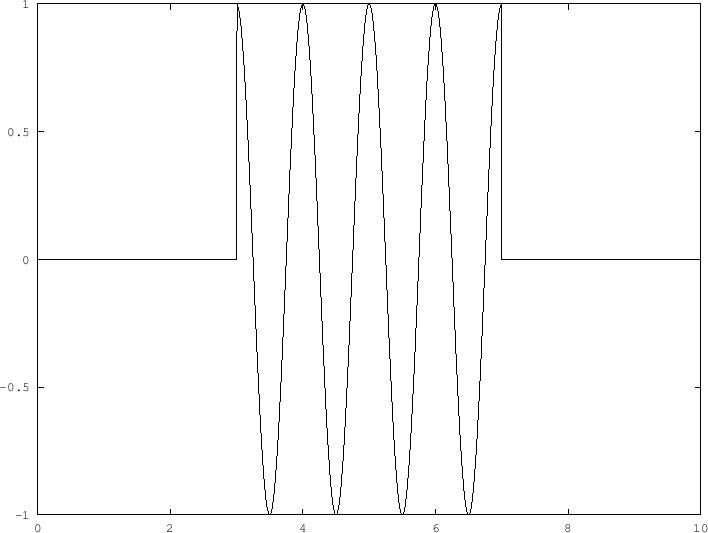 This is at least one reason (perhaps the primary reason) why sinusoids are important: if you can describe a signal in terms of sinusoids, and if you know that some operation or other acts on sinusoids only by changing their amplitudes and phases, then you might be able to find what the system will do to your overall signal. In general, a description of the makeup of a signal as sum of sinusoids is called a spectrum, and is the subject of this chapter. In the next section we'll try to make a more precise description of two possible definitions for the spectrum of a signal. In section 3.2 we'll consider how systems that preserve sinusoids--specifically, filters--affect the spectra of signals they are applied to. The spectrum of a signal can be related to what we hear as the signal's timbre (a catch-all term that just means what a thing sounds like), and so operations (such as filters) that have predictable effects on signals' spectra can be very useful in synthesizing and processing sounds. In section 3.3 we'll take up one example of this, called subtractive synthesis. In the field of acoustics, one sees at least two important types of spectra: real ones (usually obtained by making measurements on a digital recording) and idealized ones (that might arise, for example, in theoretical analyses of various systems or be specified out of thin air for compositional or other reasons). In either case, a spectrum can be thought of as a graph whose horizontal axis shows frequency and whose vertical axis shows the relative strength of a signal (or other thing) at each frequency. Real, measured spectra are usually (perhaps always) represented as continuous functions of frequency. Idealized spectra are often protrayed as using only a discrete set of frequencies; we will look at this situation first. Such a spectrum is called discrete because all the power is concentrated on a discrete set, that is, a set containing finite number of points per unit of frequency. The example here is furthermore a harmonic spectrum, meaning that the frequencies where there is power are all multiples of a fundamental frequency that is within the audible frequency range (in this case, 110 Hz). This is the spectrum of a complex periodic tone (section 2.2). A discrete spectrum could also describe a complex inharmonic tone, in which case we say that the spectrum, too, is inharmonic. 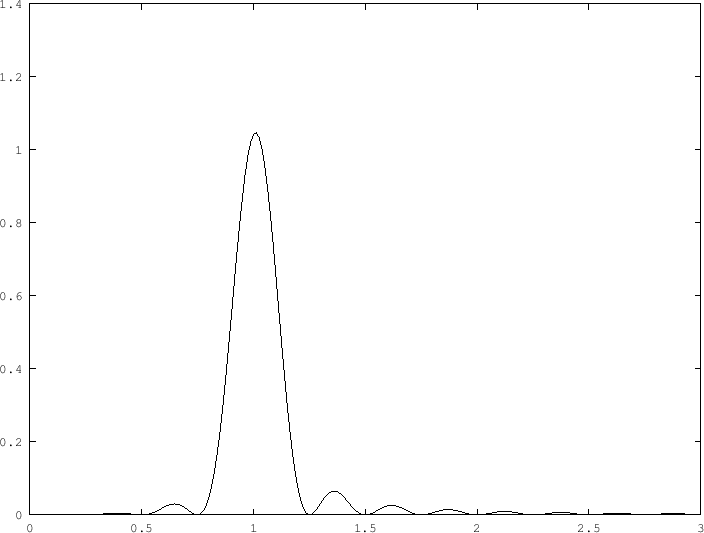 Continuous power spectra can be (and perhaps usually are) measurements of a real signal over a finite period of time (for a signal) or a finite number of sample points (for a recording). A continuous power spectrum has a physical meaning: the area under the curve over a range of frequencies (say from to is the total average power of the signal between those two frequencies. 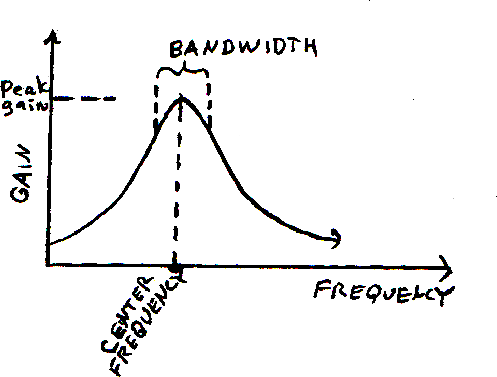 The area under the entire curve (from zero frequency to the highest possible one) is the total average power of the signal. To put this another way: the continuous power spectrum describes how the average power of the signal is distributed over frequencies. Its units are power per frequency (for instance, watts per Hz.). 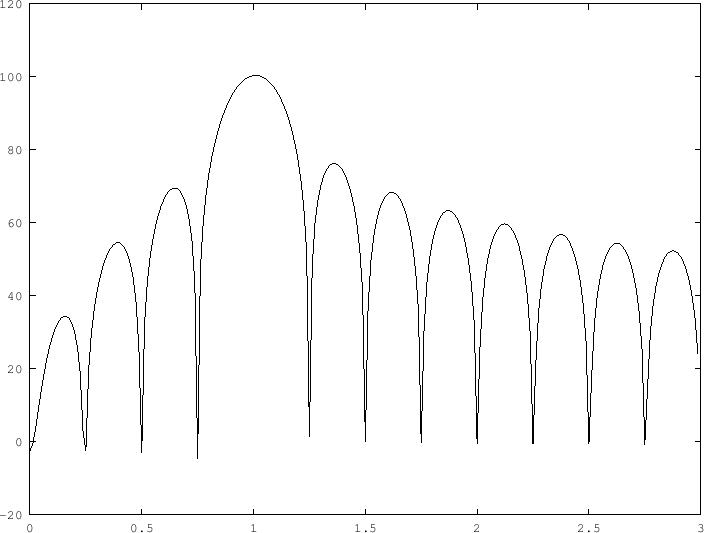 We see that, if we don't have the luxury of waiting forever, our sinusoids can look very impure indeed. In general, if we only have access to a short segment of a signal (in this example, we had only four periods of a sinusoid), so that we have nothing better to suppose than that the signal is zero outside the time window we're looking at, our attempts to measure the signal's spectrum will give us only a blurry, out-of-focus result. Why, then, don't we just collect a very long sample of the signal? Perhaps there is a practical reason we couldn't do that, but there's a deeper consideration: real signals that might arise in music, speech, or communications often change rapidly over time and in order to try to resolve how they are behaving in time we're obliged to examine them on short time scales. And the shorter the time scale we look on, more blurred in frequenct the spectrum will become. This limitation is well known in physics-- it's caller the Heisenberg Uncertainty Principle. Conceptually, the spectrum of a signal is an average over all of time. However, it is often desirable to find out what the spectrum of a signal is over a specific duration of time, or even to split a signal up into a sequence of short recordings and measure the spectra of each of these recordings separately. In this way, for a single input sound or recording, you would get a time-dependent spectrum. To do this, for any time you would consider a small interval of time (say, from to for some fixed interval of time ), and make up a new recording that consists only of those samples lying within the interval. (You can consider this extracted recording as being equal to zero outside the interval, exactly like the short sinusoidal burst we analyzed above.) and take the spectrum of that. The spectrum of this extracted signal is called a short-time spectrum. It depends on the choice of ; the larger the segment you analyze the more sharply you can resolve frequencies but the less precisely you can resolve features in time. The output might have a larger amplitude than the input at some frequencies and a smaller one at others, depending on whether is larger or smaller than one. The way we are defining gain implies that it is always zero or positive. In a widely agreed-upon confusion of terminology, the gain in decibels, equal to , is often called the frequency response in decibels. Low-pass and high-pass filters are often used to get rid of, or at least decrease, the amplitude of high or low frequencies, respectively. Resonant filters have at least two interesting functions. First, they can be used to imitate physical systems, such as cavities filled with air (your mouth or your ear canal, for example). A wah-wah guitar pedal is nothing but a foot-controlled resonant filter. Second, they permit us to (approximately) pick out a portion of a signal's spectrum in order to measure it (that's how one measures spectra in the first place) or in order to be able to treat different frequencies, that might be simultaneously present in a complex sound, in independently controllable ways. The peak gain and center frequency have precise definitions (they are the two coordinates of the point at the apex of the curve). The bandwidth is a looser notion. One often-used measure is the distance between two points on the frequency axis where the curve is a specific relative amount (often 3 decibels) lower than the peak. Real-world sounds frequently have time-varying timbres. The most prominent example of this is the human voice, in which (as we'll see in Chapter 5) the formation of vowels and consonants is reflected in variations in the voice's short-time spectrum, which can also be heard as changes in timbre. Other musical instruments behave in the same way; for instance, brass instruments tend to sound brighter when they are played louder, and it would be desirable to be able to make electronic instruments whose sounds can change in similar (or perhaps opposing) ways. SOUND EXAMPLE: Recording of a pulse, repeated 110 times per second; 5 second duration. SOUND EXAMPLE: subtractive synthesis in which the sound described above is put through a sweeping filter. SOUND EXAMPLE: subtractive synthesis; same filter, white noise as input. Some limited insight about how timbre (which is a subjective quality of a sound) might relate to spectrum (a measurable property of a signal or recording) can be gained by studying how hearing works. Hearing is in general a ferociously complicated thing that humans are unlikely ever to understand, except in essentially trivial aspects. However, the things we do pretend to understand can often suggest interesting things to try in working with computer-mediated sound. The active element of human hearing is the part of the human body that translates mechanical motion into nerve activation. This is a tiny, coiled, worm-shaped device in the inner ear called the cochlea. Vibrations that travel down its length get stronger and weaker as they travel in such a way that different frequencies are more prominent at different locations. It is a great simplification but not a complete misrepresentation to regard this as an array of resonant filters wired in parallel. Such an array is called a filterbank. Among other things, the ear seems to estimate the short-time spectrum of incoming sounds by measuring the average power, over short intervals of time, that shows up at various points along the cochlea. Something is known about the frequency response of the ``filters" that predict cochlear vibrations up and down its length. As a very rough indication, the bandwidths are about 100 Hz. up to a center frequency of about 550 Hz (or, equivalently, up until the lower edge of the band is 500 Hz.) For center frequencies above 550 Hz. the bandwidth is about 20 percent of the frequency of the lower side of the band (or, equivalently, 18 percent of the center frequency). If you lay filters out side to side obeying these proportions, it takes about 24 of them to fill the frequency range of human hearing. This set of frequency ranges (often specified as the 24 intervals between the 25 frequencies 0, 100, 200, 300, 400, 510, 630, 770, 920, 1080, 1270, 1480, 1720, 2000, 2320, 2700, 3150, 3700, 4400, 5300, 6400, 7700, 9500, 12000, 15500) are known as the bark scale. So 100 Hz. is one bark, 1080 Hz. is 9 barks, and so on. A range of frequencies corresponding to one location along the cochlea (from 100 to 200 Hz, say) is called a critical band. Critical bands overlap; for instance, 110 to 210 Hz. would also be considered one. The bandwidth of a critical band is always one bark. Measuring the short-time power spectrum of a signal arranged in Barks can offer a rough visual idea of the overall loudness and timbre of a sound. In particular, the perceived strength of a signal within a critical band appears to depend on the total power within the band. This total power then has to be converted to perceived loudness (using a conversion unit called the sone) and then all the loudnesses are added (in sones) to get the resulting overall loudness. 1. In a complex, periodic tone, how many harmonics lie between two and three octaves above the fundamental (not including the lower and upper limit)? 2. What is the interval, in half tones (twelfths of an octave), between the second and third harmonic of a complex harmonic tone? What is the gain, in decibels, at 1000Hz? 4. If you send a sinusoid at frequency 100 Hz. and average power one, through the filter of exercise 3, what is the average power of the output? 5. What is the lowest-frequency pair of partials of a 1000-Hz.complex harmonic tone that lies within a critical band? 6. If two frequencies above 550 Hz. are separated by one bark, how many half-tones are they apart? Project: Critical bands and loudness. This project tries to investigate how loudnesses of clusters of sinusoids are perceived differently when they are spaced withing a critical band than otherwise. For this experinent you should try to set yourself up with a reasonable listening environment, either using headphones or playing through a stereo (but not your laptop speaker). Start by connecting a single ``sinusoid" object with frequency 1000 Hz. to an ``switch" object (these objects are both in the Music 170 library). Now make another version (in the same patch) with four sinusoids tuned to 960, 980, 1000, anad 1020 Hz.. Connect all four to th input of a second ``output" so that you can turn them on and off as a group, independently of the first one. Make a third group of objects in the same way (or just duplicate the second group) but now set the frequencies to 500. 1000, 2000, and 4000. Now adjust the three output gains so that, as you turn them on one at a time, you judge them to have roughly equal loudnesses. Write down the three gain values you had to use to equalize them. Since the four frequencies are roughly at the same level on the equal-loudness contour chart (Wikipedia is your friend), the different frequencies should be less a factor than the spacing. Is it in fact nearly true (or totally false) that in the close spacing example, you ended up adjusting the comples tone so that its power was roughly equal to the power of the single 1000 Hz. tone? Is that still true when the four frequencies are spread widely (500-4000)?